It happens at some point during childhood: we all fall under the Disney spell. We long for a taste of magic, to meet a talking woodland creature, and maybe some of us find out the hard way that no matter how many frogs you kiss, they always stay frogs – and it’s always gross. While it’s true that fairytales don’t exist, these enchanting holiday destinations just might make you forget that fact. Regarded as some of the world’s most unique landscapes, these spellbinding locations inspired Disney’s artists to create their most iconic magical worlds. So awaken the child in you and step inside your favourite Disney classics. We know one thing for sure – they’ll have you believing in magic again. The breathtaking world of Pandora might have seemed like something out-of-this-world, but the Zhangjiajie National Forest Park is only a three-hour plane ride from Shanghai. To conjure a magical, earthy paradise unlike anything from past classics, the artists of Disney’s Avatar took great inspiration from these towering quartz-sandstone columns and their alien beauty. For easy access to the forest and parks, stay in Wulingyuan, the small town adjacent to the national park. Spring and summer are the best times of the year to visit, as the forest is at its most lush and a drifting sea of clouds accentuate the park’s resemblance to the Hallelujah Mountains. 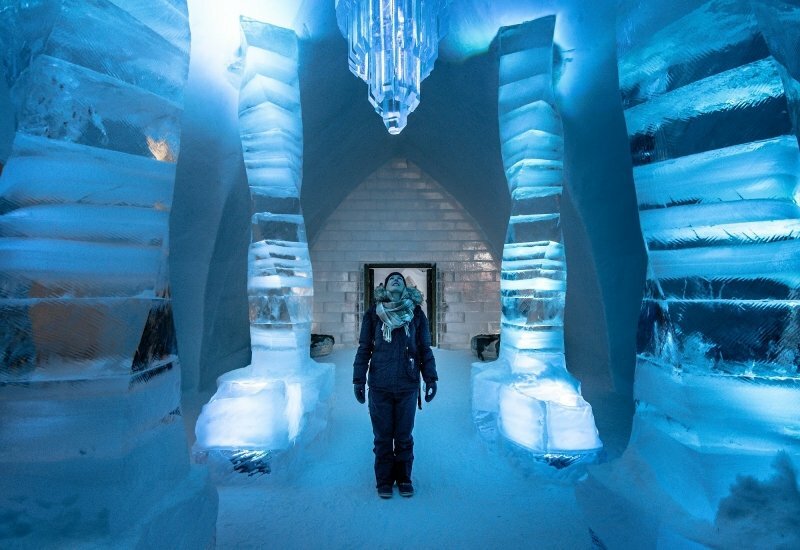 Norway can take credit for inspiring Frozen’s Arendelle, but Elsa’s magnificent ice palace was based on none other than the Hôtel de Glace in Quebec – and it’s cool in more ways than one! We know what you’re thinking, and the answer is: yes, all the furniture really is made of ice. While beds have a comfortable wooden base, all of the hotel’s furnishings and architecture are formed from a special blend of ice, designed to withstand humidity. With hotel temperatures between -3°C and -5°C, visitors are expected to stay wrapped up indoors. However, the hotel’s luxurious amenities mean that guests are never uncomfortable. Within the walls of this unusual tourist hub, one can expect to find numerous hot tubs, saunas, fireplaces, an ice slide, five restaurants, and even an ice bar serving cocktails in glasses made of ice. The hotel is conveniently located only a twenty-minute drive from Quebec City. However, due to Canada’s changing seasons, it is only open from January to late March. During winter each year, the hotel is rebuilt once again to resemble a sprawling, icy paradise. The rebuilding process only takes six weeks and a team of fifty to complete – or maybe, just one Elsa? Trivia: The Hôtel de Glace has been described as one of the world’s Top 10 Dream Wedding Locations. 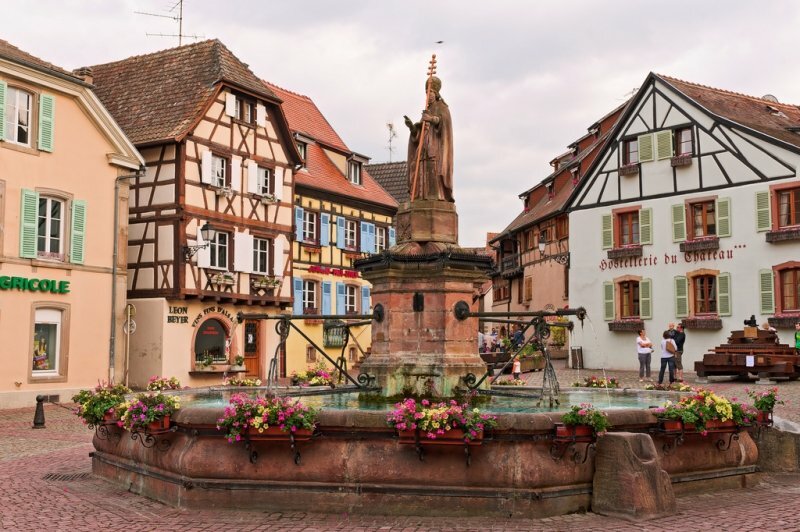 The quaint French villages in the Alsace region of France are, in many ways, like Belle herself: humble, but rich with beauty and distinct character. The towns are freckled with adorable cafes, cute little pastry shops, small rushing fountains, and the magnificent castle lurking in the distance certainly brings to mind a mysterious beast watching from the windows. For the full Belle experience, walk the cobblestone streets of Riquewihr or Ribeauville with a book in hand. But remember, even in France’s fairytale towns, singing in the streets is seen as highly unusual. Strasbourg International Airport is a half-hour drive from Alsace. What’s more, travel within the region tends to be quick and easy, due to the efficient railway system that connects all towns. With so much beauty in the surrounding areas – and Paris less than three hours away! – your trip to Alsace is bound to be magical. And while you’re there, why don’t you visit the mystical Black Forest, the inspiration behind many famous Grimm’s fairytales? It’s only an hour drive away! 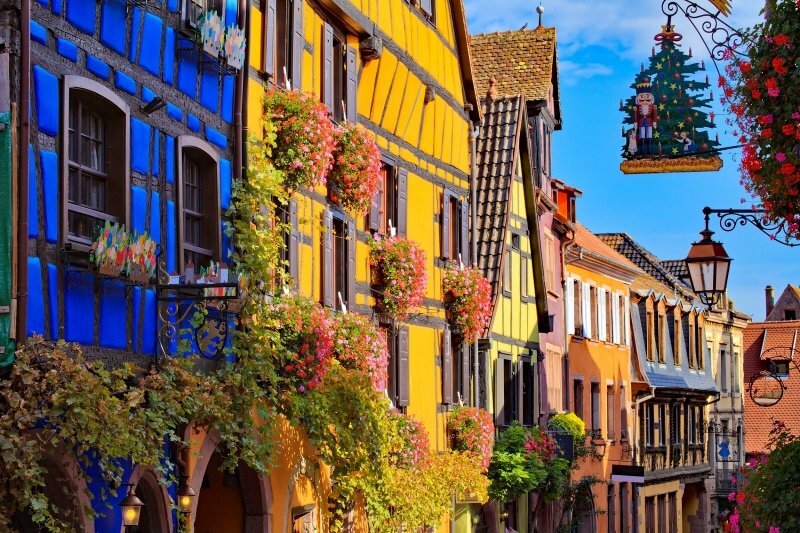 Trivia: Aside from its classic fairytale charm, the Alsace region is also known for producing some of France’s best wine. Sitting atop the dramatic hills of Bavaria, Neuschwanstein Castle stands regal and proud. It is by far the most famous fairytale castle in all of the world. 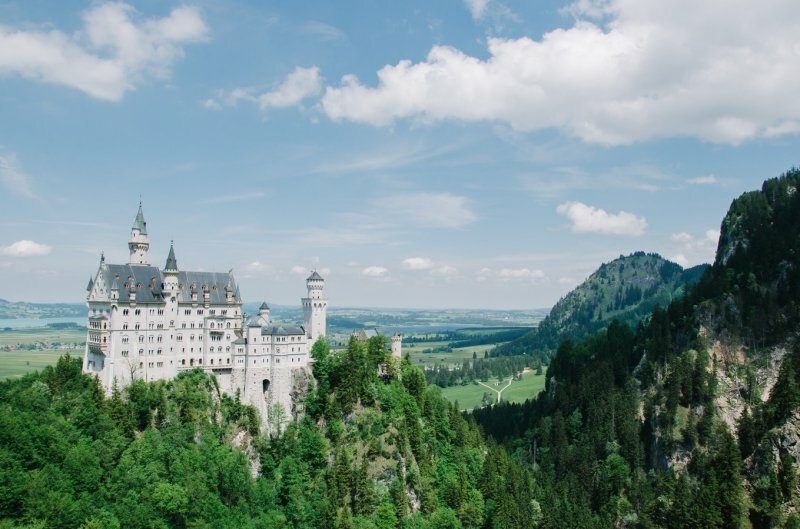 Not only did Disney artists base Sleeping Beauty’s castle on Neuschwanstein’s pristine beauty, but Walt Disney himself used it as inspiration for Disneyland’s Magic Kingdom. Its cinematic scenery and architecture are so breathtaking, that it was almost named one of the new Seven Wonders of the World. The castle is located in beautiful Bavaria near the Austrian border. We highly advise staying in one of its small surrounding towns to make the most of Germany’s most enchanting landscape. We recommend looking into places such as Garmisch Partenkirchen or Fussen. For a day trip, train-travel takes less than three hours from the city of Munich. 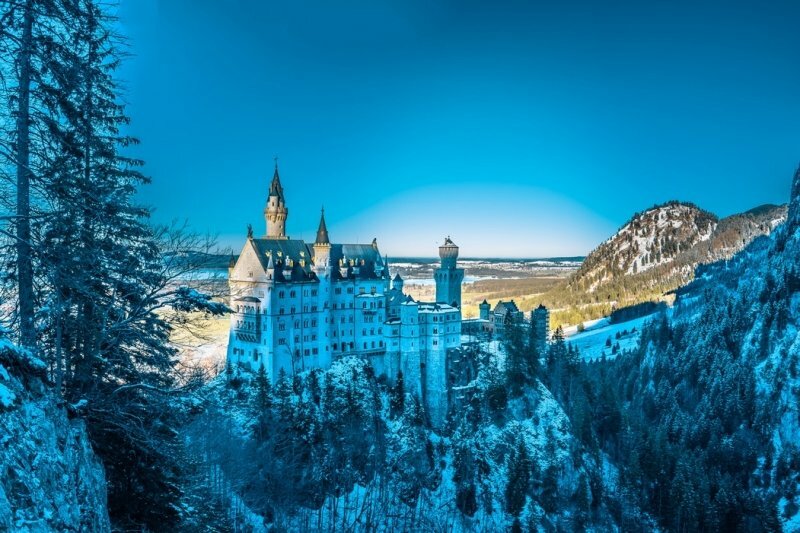 Trivia: It took so long to complete construction of the Neuschwanstein Castle that the King who built it only slept there for 11 nights before he died. Ask anyone who’s been to Scotland and they’ll tell you the Highlands are steeped in magic and mysticism. To accurately reflect the unique heroine Merida in Brave, artists sought something different from the immaculate beauty of other princess castles. 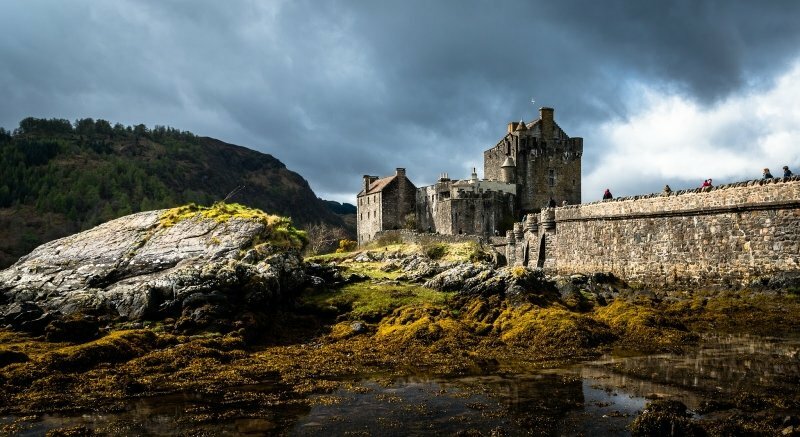 Instead, they studied iconic Scottish structures such as the Eilean Donan castle, a symbol of wild, earthy beauty, shrouded in an aura of magic and mystery. Travel from Scotland’s capital takes four hours by car or train, but visitors agree it is well worth the visit. Our advice? 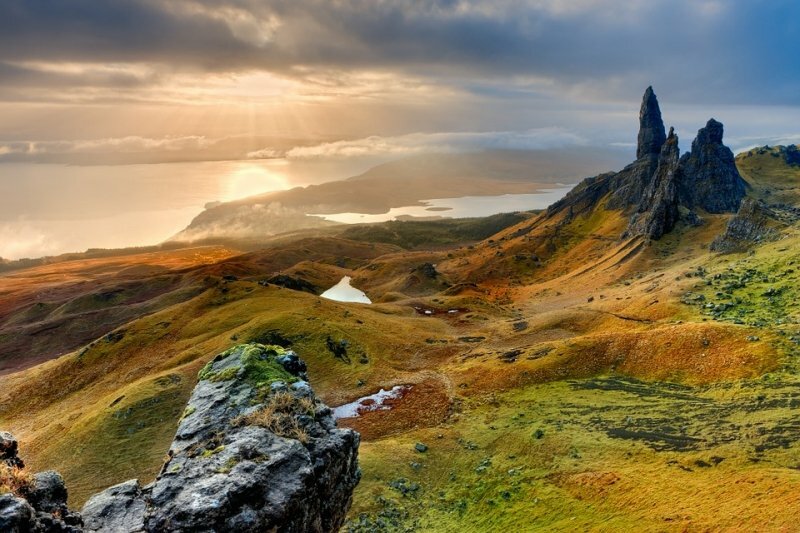 Spend at least a few days in the Scottish Highlands, either in Inverness or the Isle of Skye, to fully experience Scotland’s rich, mossy beauty. And did we mention Scotland is where the fairies reside? Trivia: Boo! Did you know that Eilean Donan Castle is said to be haunted by the ghost of a Spanish soldier who was killed in battle? Okay, we might have gotten a little carried away there – but you get the point! 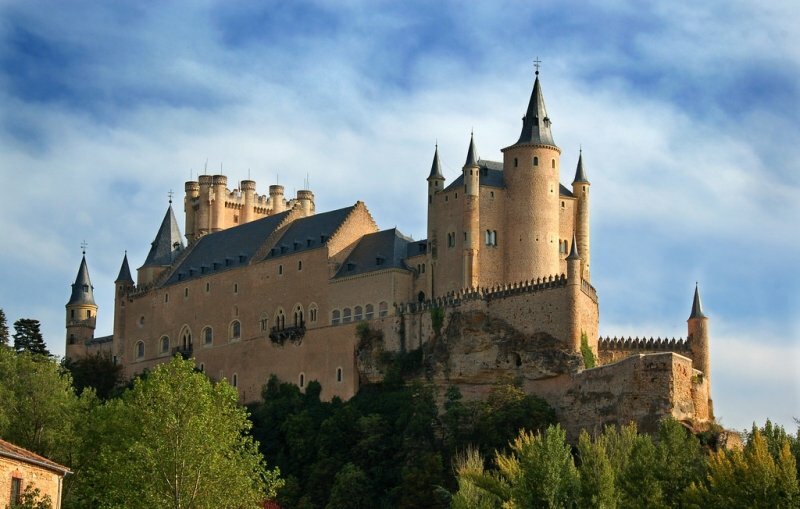 Thankfully, the real story behind the castle of Segovia is much less frightening. Today, it’s considered one of Spain’s most beautiful castles, due mostly to the many cultural influences on its architecture. It was constructed almost a millennium ago as a simple Moorish fort, taking many design influences from traditional Islamic architecture. More defensive structures were added to it during times of war and later on, rulers modified it to have a more Gothic appearance. The last big renovation took place a few centuries ago. That was when a Spanish king added the sharp spires, an architectural feature that was becoming popular in Europe at the time. Today it stands as an amalgam of aesthetics from many different periods. And a little secret? It’s also said that the castle has a number of secret passages leading to other palaces in the city! There are several ways to travel to Segovia, but most visitors prefer to make a day-trip from Madrid. Segovia is only a one-hour drive from Spain’s capital. Despite the long journey, the sights along the way are sure to make it a memorable journey. It is also recommended to visit during winter when local restaurants feast on suckling pig and wine. 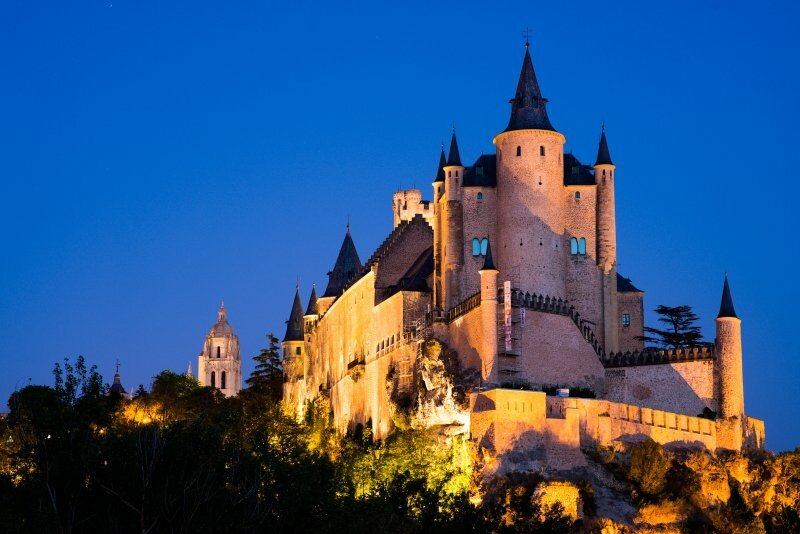 Trivia: Did you know that Segovia was voted one of the most romantic destinations in Spain? At high tide, the Mont-Saint-Michel seems almost an exact replica of the island kingdom, Corona, from Tangled. Unlike Rapunzel’s birthplace, however, it’s crowning glory is not a traditional castle, but an abbey that serves as the main attraction of the island. The local population of Mont-Saint-Michel is a mere fifty people. However, the place bustles in the daytime as it remains a hot-spot for tourists all year round. Despite being a very small town, there are a number of restaurants scattered across the island to ensure tourists don’t get hangry – and not to mention, numerous little cafes for that heavenly caffeine fix! 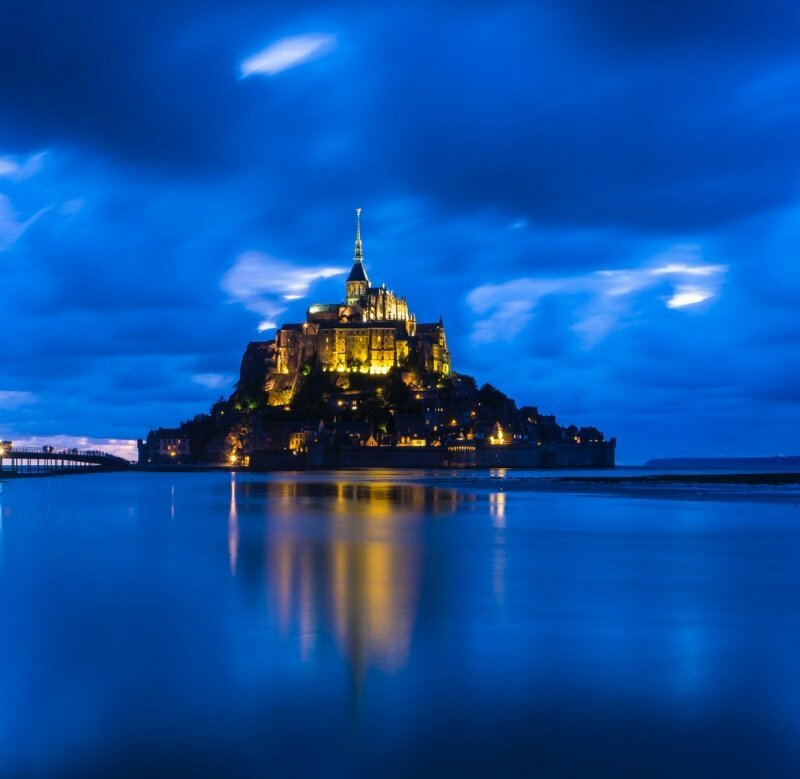 For the most breathtaking view of Mont-Saint-Michel, it is recommended that guests witness it during sunset and nighttime, and at high tide when its reflection in the surrounding waters casts an otherworldly glow. To ensure you see it at the right time, check the tide schedule before you go. Trivia: In the 8th Century, a bishop had a vision in which the archangel Michael instructed him to build an oratory on the island. This is how the Saint-Mont-Michel came to be. If you think you’ve seen this landscape elsewhere, you’re correct. 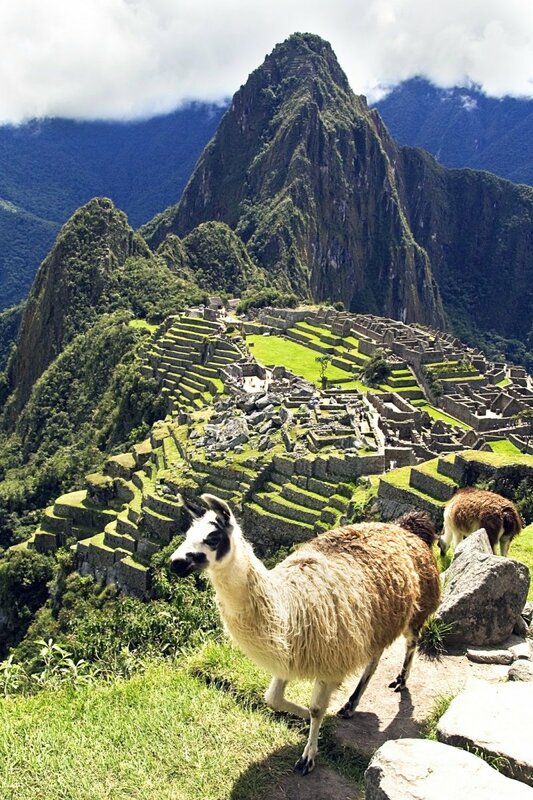 It’s straight out of the Disney Classic The Emperor’s New Groove – even down to the llama! This sacred site was the once-upon-a-time heartland of the Incan empire. Unlike the other destinations on this list, its Disney counterpart actually portrays (with added quirks, of course!) its ancient civilization. To take in one of the most marvelous views in the world, take a flight from Peru’s capital city to the local region of Cuzco, where travelers will have no trouble finding hotels and restaurants. From there, a bus takes visitors up the winding path to the ancient ruins. Frequently voted as one of the most spectacular places in the world, we know you won’t want to miss it. 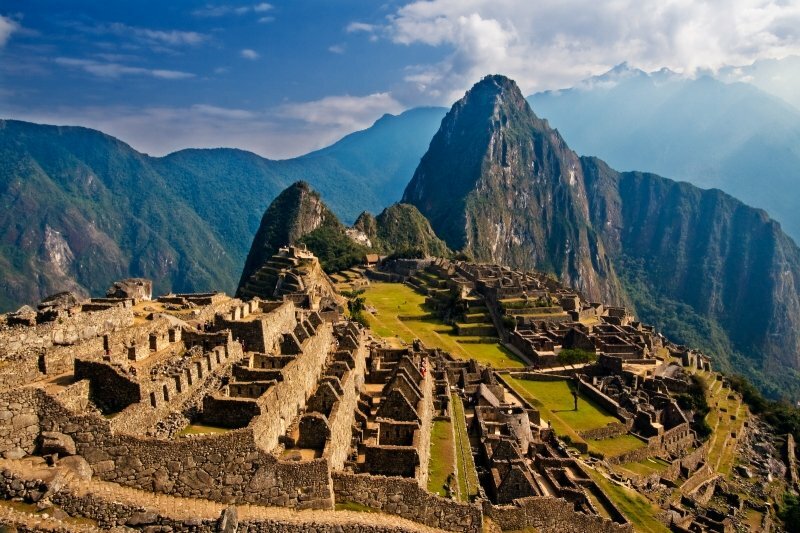 Trivia: Much of Machu Picchu is still shrouded in mystery: Why was it built? How did the Incans move such large pieces of stone without our advanced technology? And why was it abandoned? See what we mean? You don’t need the movies to encounter magic – it’s all around you! Now, let’s turn this pumpkin into a carriage and head out on a new adventure! Sara is drawn to the weird side of travel: bizarre food, obscure and otherworldly locations, dark histories, and alien, offbeat beauty. She’s also a Harry Potter nerd (Slytherin house, of course) and a cheese fanatic with the uncontrollable urge to pet every single cat in sight.